Shortly after Nova Scotia elected a new government in 2017 its Energy Minister stated, "Anything we add at this point is not going to be wind." Its neighbour, New Brunswick, issues an Integrated Resource Plan that same year, which didn't foresee a need for any new generation until after 2026. It does have a target of 40% renewable supply by 2020, but it was already at 36% and was to concentrate on "Locally-Owned Renewable Energy Small Scale (LORESS)" to attain its goal. to NL: let bygones be bygones and let's make a deal. You don't have much of a choice. to ON: we'll get it done. You should buy from us. Safe to assume Quebec and Newfoundland will both have their focus entirely on hydro sites for some time. Ontario, home to 40% of Canada's industrial wind capacity, also elected a new government it 2018 - one which promptly exercised the cancellation clause on every contract for wind generation it could. 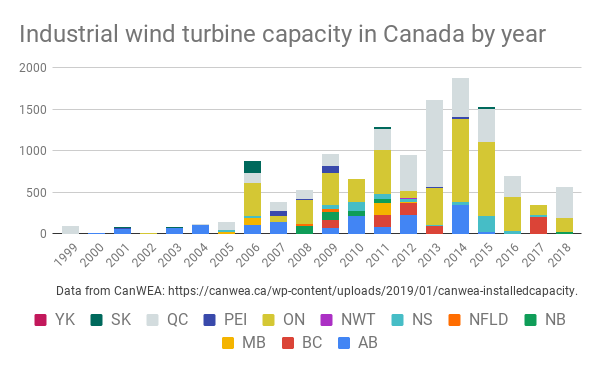 Manitoba was a trendsetter in turning from wind back in 2014 it was noted, "Manitoba Hydro officials say wind power isn’t a viable option for energy production in the province." It currently is focused on its own Keeyask hydro project - and would look to the larger 1485 MW Conawapa project if there was a need. Like other hydro-rich provinces, Manitoba has searched for export markets, and it found one in Saskatchewan. Late last year the two provinces agreed on increasing their transmission intertie capacity to allow more hydro-electric generation into Saskatchewan. Saskatchewan, and its western neighbour Alberta, are two provinces where the news for the wind industry has been good. Both provinces have goals for share of electricity supply from renewables, and both have been contracting wind to meet those goals, although there are likely to be changes to the situation in Alberta due to an election (tomorrow) so I won't waste time here except to note where I spent time writing on Alberta's situation before: Alberta. Bound. Zapped concludes that it is unlikely that wind and solar energy can be generated in a competitive manner in BC under current conditions, and that BC Hydro holds sufficient “green certified” energy to meet limited trading opportunities with California. Seems most exporting provinces have arrived at that same conclusion. Wind's immediate future looks bound to the two western, high emission, oil and gas provinces. And maybe Prince Edward Island - which might elect a Green government. That'd cause some mind- molding articles. Breaking the mold today was the Canadian Nuclear Association. Mr. Gorman is currently President & CEO of the Canadian Solar Industries Association (CanSIA), the national trade association for Canada's solar energy industries. He oversees all of CanSIA's activities including government affairs, research, communications and industry leadership. This caused me some cognitive dissonance. I've been an opponent of expensive contracting of renewable for many years - and for my province (Ontario) solar has been similar in total cost to wind. And yet the wind industry created contempt in many communities it touched - I received e-mails on the weekend in disbelief the promotional piece in a supposed newspaper championed men who people feel hurt people - while I've not seen contempt for solar. I looked at solar to see if there's a difference in that trend, and it seemed to me the only difference was it peaked a year later, in 2015. The data is not good for solar. Statistics Canada's Table 25-10-0022-01 shows "annual generating capacity by type of electricity generation". It reports 2,298 MW for solar in 2017. 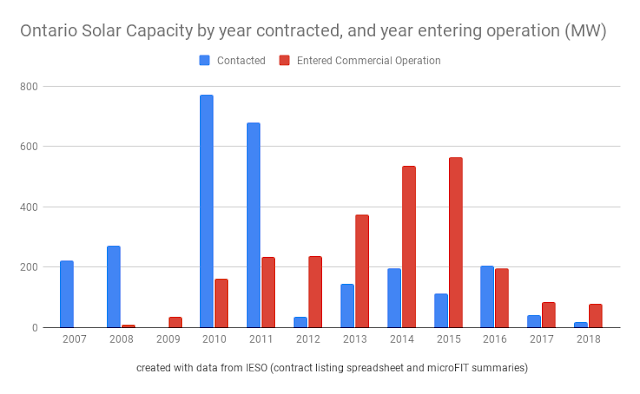 I've worked with the IESO's Active Generator Contract Lists, and its microFIT reporting, and my tracking showed Ontario with more solar than all of Canada - which seems unlikely. What does seem likely is most solar in Canada is located in Ontario, and Ontario's contracting of solar dropped sharply after 2011 with capacity entering commercial operation peaking in 2015. This indicated 6/7th's of 2015 installs were in Ontario, which matches my estimate that 86% of all capacity was in Ontario by that time. I suspect CanSIA have not reported totals for subsequent years as the news ceased getting better for them.